A medicine ball is a fairly standard item in anyone's arsenal of workout equipment. When we go searching for new items to review at Consumer's Survey, we not only look for quality, but we look for prices that aren't going to break the bank. The Valeo Medicine Ball peaked our interest because the price was pretty decent, and after studying the various reviews available online that numbered in the hundreds, we decided it was worth it to check it out for ourselves. This medicine ball is constructed of a sturdy rubber and has a textured surface, giving you a great grip. The durable construction of this ball lets it bounce off of hard surfaces. Using a medicine ball like this helps to improve your balance, coordination and endurance, plus it helps to develop your core strength, making these little balls a very popular item to include in your regular workout routine. 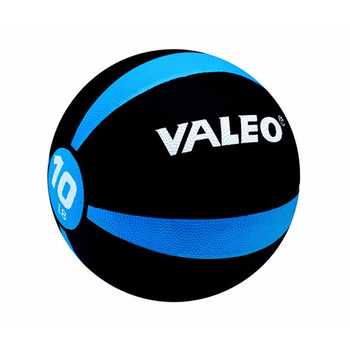 The Valeo Medicine Ball is firm enough to be used for workouts that involve doing pushups directly on the ball. It is important to have the right equipment when doing this, as there is such a thing as soft medicine balls which would never work well for pushups and similar types of exercises where you need the ball to be rigid. We noticed that many people purchased this ball for P90X workouts, and they had great results with it. Upon receiving this medicine ball, we noticed first off that the grip it had was excellent due to its sticky rubber construction. The grooves and textured surface also increased our grip and we did notice some soreness on our skin and finger tips after using it as other reviewers stated. Brand new out of the box there was a strong rubber odor, and after using the ball you might notice a slick or sticky feeling on your hands, but this can be washed off with soap and water. From using this ball, if you are going to be bouncing it off a wall, we'd recommend to make sure that the surface was hard like brick, and not drywall. The ball might leave scuff marks on some surfaces as well, so it is best to be careful. These balls are great for any fitness level, as they are easy to hold and are very sturdy. The construction seems very well-made, which pleased us considering that equipment like this would likely be taking some abuse just from frequent use alone. It is a versatile product which can be used for all kinds of different workouts, so various people can make use of it. Plus, they come in different sizes of eight, ten or twelve pounds depending on what you need them for. Some customers had trouble dealing with the rubber smell that this ball produced, and others said they had difficulty gripping it due to it being too being too big for their hands. There were also a few customers who experienced their Valeo Medicine Ball splitting open after a short time of having it, so needless to say they were not very pleased with their experience. However, for the vast majority of consumers who have purchased this ball, it has served them well and they are quite pleased with it, as are we at Consumer's Survey.